The sheet is limited to 2500 numbered copies. 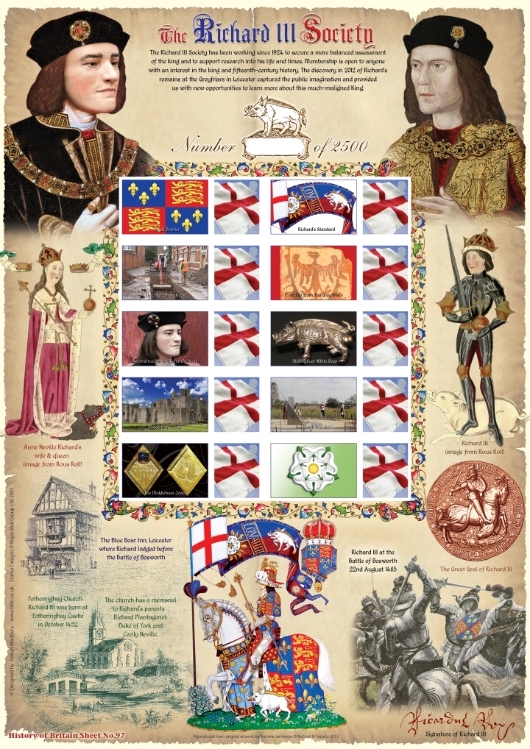 The Richard III Society commissioned Adrian Bradbury (BFDC Ltd) to design and market this business customised stamp sheet featuring the discovery of the remains of Richard III in Leicester. The Richard III Society has been working since 1924 to secure a more balanced assessment of the king and to support research into his life and times. Membership is open to anyone with an interest in the king and fifteenth-century history. The discovery in 2012 of Richard's remains at the Greyfriars in Leicester captured the public imagination and provided us with new opportunities to learn more about this much-maligned King. The sheet features images from the life and times of King Richard from his birth at Fotheringhay to his death at the Battle of Bosworth. Images include the facial reconstruction of King Richard III, his Great Seal and signature. The ten stamps feature the flag of England which is also included in Richard's Standard.